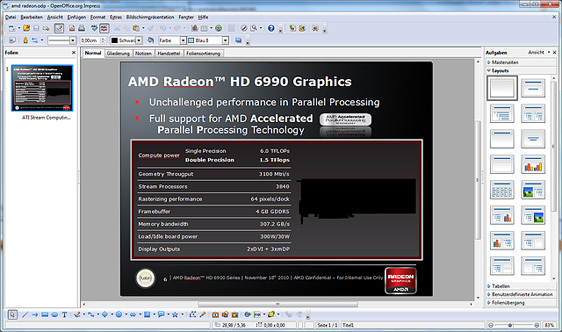 Rumors appears on the net about the next AMD dual GPUs graphic card showing more information about the next AMD HD 69xx series Cayman-based graphic card, it is a slide show with a date of 18 November , the slides also shows the first benchmark test of the HD 6970 from AMD VS the current HD 5870 one on a tessellation performance test and the new Cayman-based architecture used . 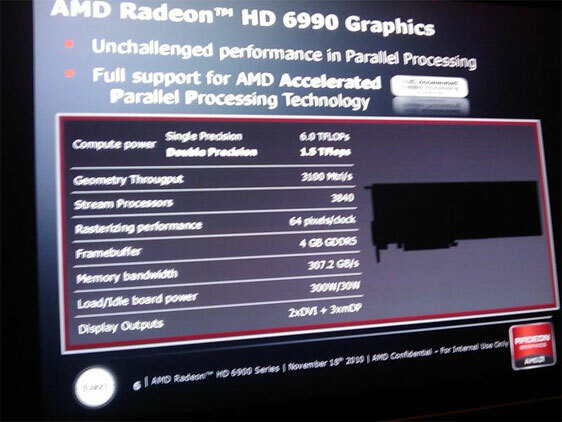 According to the leaked slide the Radeon HD 6990 offers a total of 3840 stream processors (1920 per GPU) and four gigabytes of GDDR5 memory. Memory bus bandwidth reported is 307.2 gigabytes per second, the TDP value is 300 watts and running at 30 watts during sleep mode , the outputs according to the slideshow are two DVI-and three mini-DisplayPort connector. Still to officially confirm that , please stay tuned. Update : the specification slide is fake reported German 3DCenter website and its powerpoint made and taken with a digital camera, so please stay tuned for the official details .